The Sarojini Naidu Centre for Women Studies (SNCWS), JMI was established under the aegis of the University Grants Commission in September 2000 and is one of the oldest Centres in JMI. The very name of the centre invokes the ideals set out by Sarojini Naidu. Fluent in Urdu, Telegu, Bengali, English and Persian, Ms. Sarojini Naidu was a Political activist, Feminist, Poet, Writer & Orator. She travelled across India, lecturing on social welfare, women empowerment, emancipation and nationalism. As a distinctive Academic discipline, Women’s Studies has a core area of theory and it draws on knowledge from various disciplines, Humanities, Social Sciences, & Sciences. It also draws from it’s own studies and Field Action, besides useful knowledge from other disciplines. The focus is MULTI/INTERDISCIPLINARY and expanding the frontiers of knowledge about the manifold facet of societies and economies, giving it the essential critical edge. As a discipline, Women’s Studies has established the implicit social responsibility to transform/influence other disciplines to include the feminist perspective, develop and empower women generally and more specifically increase their visibility in teaching, research and management in the universities and colleges by enhancing their academic strength and competence. Recognised and indeed guided by the University Grants Commission (UGC), Women's Studies is a discipline in the UGC’s list of disciplines for the NET and JRF programmes. From its inception, Jamia Millia Islamia has been co-educational, a rare milestone of gender equity in a University, and SNCWS - accredited as one of the Phase-III Advanced Women’s Studies Centre in the country by the UGC, has since taken many significant steps towards achieving awareness and sensitization of gender issues in the Jamia campus and the surrounding communities. 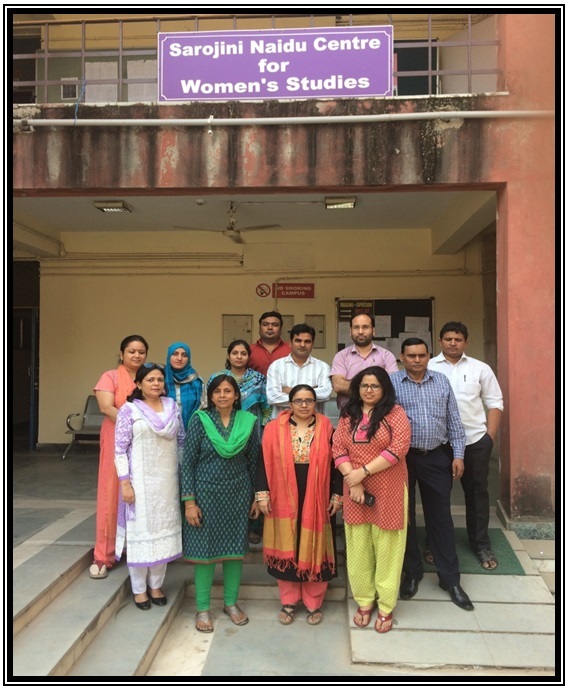 Strengthening Women’s Studies through Teaching, Research, Publication, Translation (especially Urdu) and documentation, the Sarojini Naidu Centre for Women Studies plays a vital role in mainstreaming gender perspectives into the academic and other development processes in the community life of Jamia Millia Islamia and its surrounding communities. Evolving a Gender Perspective in developing and regularly revising the Curriculum material, Research Studies, Field action, Documentation and Extension Activities, SNCWS seeks to uncover discrimination against women through the questioning of existing discipline wise concepts, tools and techniques that justify the denial of equity for women making them marginal and invisible. UGC Capacity Building of Women Managers in Higher Education is an on-going initiative being taken forward by SNCWS. The implicit challenges and opportunities that Liberalization and globalisation offer along with changes in higher Education, and the emergent socially diverse students indeed the larger JMI Community are sought to be balanced by the interactive pedagogy, Screening & Discussion of Instructive & didactic films, Capacity Building, Networking, Advocacy, Mentoring, & other collaborative endeavours with the Police, NGO’s, GRC’s, Corporate & Development Organisations (under CSR), State and National Commission of women, and other UGC Women Studies Centres.